This is some of the loveliest packaging I’ve experienced with a subscription box. Every detail seems to be thought through. Even the box is perfect for storing keepsake items or photos. An essential part of getting ready is a nice, luxe robe. Since putting on the dress is probably the last thing you’ll do before heading out, it’s nice to have a pretty robe to lounge in while doing your hair and makeup. I like that it’s knee length and that there’s an inner tie as well as the sash to make sure it stays closed. The blush color is beautiful in photos too! This was one of the items I never knew I wanted until now and I think it is great that it’s included. It makes a great storage box for the rings before the wedding but also is a beautiful way to photograph the wedding set together. The insert has two slots and is removable so you can layer whatever you like inside. We just used some paper here but it would be lovely with some florals or beads that match your decor. These little booklets are another great idea! 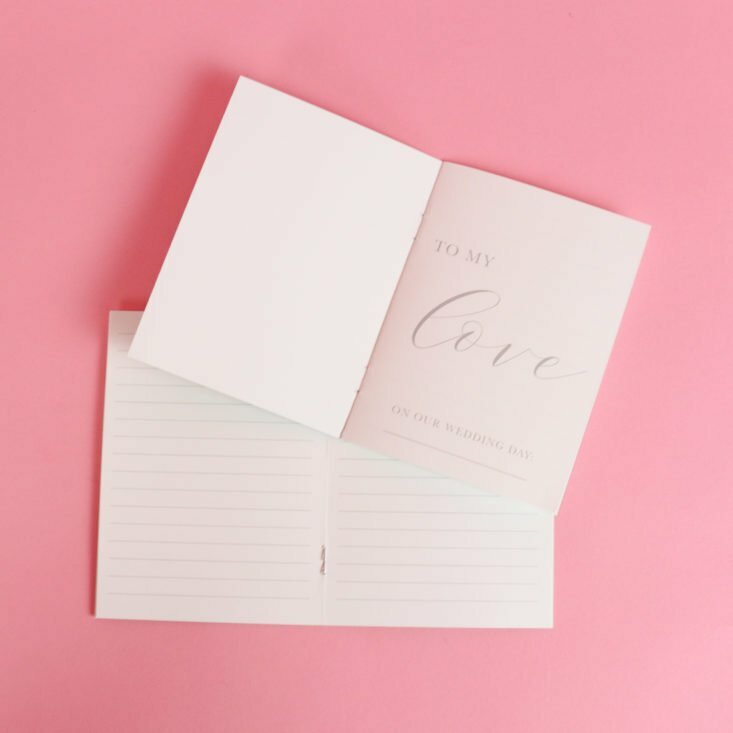 Whether you’d want to carry them down the aisle or just take notes while writing your vows, they are useful, beautiful, and will make a perfect addition to the keepsake box after the wedding. You get a “His” and “Her” vow book with 6 lined pages of thick cardstock. Bonus – a cute hair elastic is holding them together. Are you sensing an acrylic theme? I am! The good thing about these pieces is that they can seamlessly fit into any decor and be used for the big day or the celebrations leading up to it (or both!) This little acrylic sign reflects the same Pop Fizz Clink! saying from the bottle opener in the Intro box which is a great idea to tie the boxes together. I think it’s perfect for setting on the bar or for decorating at brunch. Speaking of celebrations, you’re going to need some jewelry for all those cute outfits you’ll wear. Maeven gave us a simple and chic, long silver bar necklace that’s perfect for so many outfits. Or, for pairing with your silk robe for photos! The chain is 14″ long and has a 2″ extender. The bar is 2″ long and hits at my bust when I wear it at the shortest length. If you’ve used a makeup sponge to apply your makeup, then you probably know it’s a great way to achieve a full-coverage, airbrush finish. I’m so happy with this sponge! It expands to double the size and is soft and bouncy like it should be. The base is flatter than other sponges which makes it great for covering a large area fast. And…of course, you need a sponge holder! In these photos, the sponge is dry, but once it’s wet, you have to flip it over to set it in here. The rose gold spiral looks so cute on my vanity and it keeps my sponge from rolling off the edge. Plus, it allows sponges to dry thoroughly between uses. Anyone who signed up during Black Friday weekend will receive this bonus acrylic countdown sign and marker which coordinates with the other decor items that have been included. The marker wipes off cleanly and can be used to mark wine glasses too! Verdict: I’m feeling the same way about this box as I did last month – I love it! From the beautiful packaging to the practical and keepsake-worthy items, I’m super impressed with how well thought out each detail is. I would have loved to have received this as a gift during my wedding planning process and certainly would have subscribed myself. It means a lot to slow down and enjoy the time leading up to your wedding, even if it is hectic, and this is such a treat. So far, I’ve received everything I’d need to get started planning and everything needed for a luxurious morning-of pamper session. I can’t wait to see what Maeven has in store next month. Can you still get this box if you sign up today? If you sign up today (or any day) your first box will be the Intro Box, then you’ll fall in with the monthly theme each month. Check out all of our Maeven Bride Box reviews and other bridal subscriptions in the Bridal Subscription Boxes for Women List! What did you think of the November Maeven Bride Box? Can you personalize sizing on this? Just wondering about that robe. Such a lovely looking box! I’m past the need for this at 4 years married, but it still looks like so much fun! Great review!